Containment Protocols: RPC-325 is to be kept in a 15x15x15cm glass display box on a single purple velvet pillow, with no less than three combination locks attached to the box, one per non-hinged side. The glass case will be stored in the ██████ Wing on Site-88. Any testing made to RPC-325 must be approved by either by Senior Researcher Thompson, or by Director Roberts. 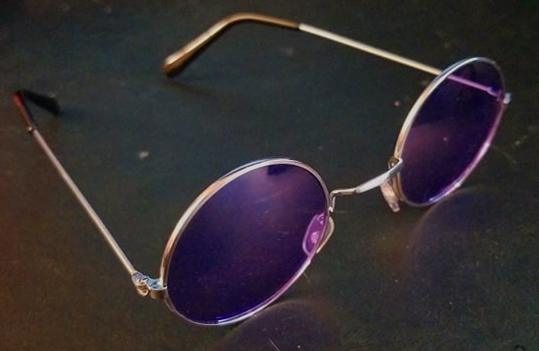 Description: RPC-325 is a single pair of round lens sunglasses, with a purplish hue for the lens. RPC-325 came to the Authority's attention when the staff at the ██████ Nursing Home For The Elderly found a pile of ashes in a wheelchair, along with RPC-325, sitting on top of the ashes. Staff who were nearby described the event as "like hearing banshees escape that poor man's soul". The staff was treated with Class-A Amnesiacs, and the family of the victim was informed of their loss due to "poor fire safety precautions". RPC-325’s anomalous factor comes into play whenever a subject wears RPC-325; they assume the role of a woman who is seemingly living out their normal life. This woman is acknowledged as RPC-325-1. RPC-325-1’s age and physical appearance reflects that of the subject. This means that the exact age and timeline of RPC-325 and the subject's will be the same. More so, the subject will also feel what RPC-325-1 is feeling as well, depending on what is going on with RPC-325-1's timeline. The full extent of "feeling" has yet to be fully explored. Under the request of Director Roberts, RPC-325 will undergo testing immediately. Test will include subjects of various ages wearing RPC-325 for 10 minutes, and have them describe the event in as much detail as they could. Testing will begin in ██ days. Description Of Event: RPC-325-1 is currently in a cafe of sorts, later learned to be located in ██████, New York. Subject describes it as cold and frigid, despite lab temperatures being at 25°c. Subject also describes the current drink RPC-325-1 is drinking as coffee, light with sweetener and heavy in cream. Conclusion: Subject can taste and feel what RPC-325-1 can taste and feel, no matter the current state of the Subject. Will proceed will more testing. Description of Event: Subject begins crying, and proceeds to assume the fetal position, remaining there for the remainder of the test. After testing, Subject describes holding a picture of an unknown man, in his early 20’s. Subject says she feels “immediate regret", describing it as a feeling someone would have immediately after a break-up in a relationship. Conclusion: more insight in RPC-325-1’s teenage years would help with research. Permission from Director Roberts is still in discussion. Description Of Event: Subject immediately begins laughing upon wearing RPC-325. Subject describes it as a dinner party amongst 5 individuals. The description of one such individual matches that of the individual in the picture in Test 325-9. Subject describes the dinner party as a wedding anniversary, as she describes the ring RPC-325-1 is wearing. Upon ending the test, the Subject describes the feeling as “overwhelming joyful”. Conclusion: RPC-325-1 seems to have what many would describe as a Full Life, albeit a non-unique one compared to most. Discussion on finding RPC-325-1’s exact moment of postmortem is ongoing. Description Of Event: Subject begins screaming, repeating the words "Get away from me!" Subject was then [DATA EXPUNGED] [See Addendum ██-██-20██. LEVEL 4 SECURITY CLEARANCE REQUIRED]. After testing, subject ran to Professor ██████'s arms, refusing to leave her sight for several hours. Conclusion: Any testing with Subject's under the age of 13 years will henceforth be restricted, as the risk of triggering a [REDACTED] event is too great. Decision to reclassify RPC-325 is ongoing. Description Of Event: Subject begins to scream in agony. Subject's body beings to contort violently, limbs twisted to the point of breaking a bone. Subject dies abruptly within 3 minutes, body remaining in the contorted position after the removal of RPC-325. Conclusion: Due to the Subject's old age, the chances of reaching a point past RPC-325-1’s date of death was great, however, we were not expecting the result that was presented to us. Discussions to continue testing are ongoing at this time. Due to the events that were Tests 325-24 and 325-██, all testing related to RPC-325 will henceforth be terminated, and will remain locked in containment until further notice. However, RPC-325’s classification will remain as Alpha, per instruction of Authority higher ups. I understand the need to find out more about RPC-325 and RPC-325-1, but I can assure you, it is not worth the price to pay. We paid enough as it is. We gave up life and innocence to find out the full story of RPC-325-1, but was it worth it? In my opinion, no. For the price to pay, it was not worth the pain we caused.